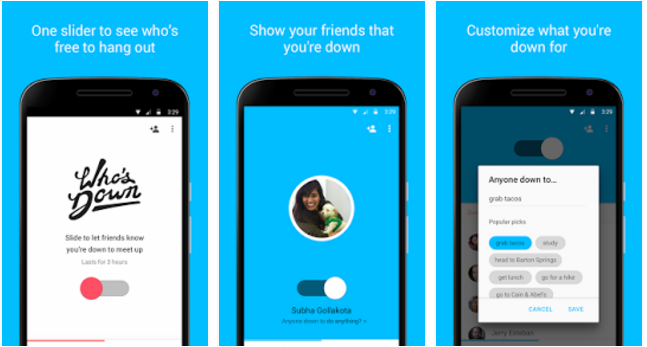 Google has launched a new messaging app christened, ‘Who’s down’ by using the concept of the already existing, ‘Hangouts’. So far, all we know about this app is that it’s currently in the ‘invite-only’ stage, a popular tactic used by Google to lure customers and is restricted to ollege students. The main focus of the app is to find like-minded people to group up and start a chat! Simple indeed. Since it’s for the college students for now, you actually do not need to sign up with your academic email address however it does as k you to fill up the college name in order to join the waiting list. It is clear that Google wants to expand itself in the social media sphere in any way possible and make a mark, starting with college students as it;s quite a good business strategy since most of the students are hooked on their phones. The design of the app is Googlish and comes with a white-blue design scheme. The user would have to move the slider to show availability and also type in interested activities or hobbies to match with others as well. The app will eventually notify the user if a number of people respond to the request. The good thing about the app is that it gets deleted within 24 hours. Although chatting apps aren’t revolutionary anymore, the concept of testing this app with the students was a smart move. If the students find interest in the app based on the design and the features, there’s a high probability that the rest of the audiences would hop in as well.